This is a high performance, pro quality, big game seven+ foot long pole spear! Perfect for travel, the MAKO Spearguns Big Game Pole Spear is designed for just that - Pole Spear fishing for Big Game. This is a rock solid Pole Spear made of durable, yet lightweight aircraft grade aluminum with "sure grip knurling" in the grip zone. Two Pole Spears in one! When Pole Spearing for big game, connect all 3 sections, plus your desired MAKO Pole Spear Tip for Big Game Pole Spearing Machine that measures 7 feet 2 inches long! For Lionfish Hunting or hunting smaller game, simply connect just 2 of the 3 sections, for an awesome small game pole spear! Three pole spear sections of solid 5/8" aircraft grade aluminum. Pole Spear Tip is industry standard 5/16" female thread to accept a wide variety of tips. One latex Pole Spear Power Band for pole spearing with all 3 sections. One latex Pole Spear Power Band for pole spearing with 2 sections. DOES NOT INCLUDE TIP! CHOOSE YOUR TIP FROM THE LIST BELOW. Our Big Game Traveler Pole Spear includes sure grip knurling cut into the pole spear for enhanced holding strength. 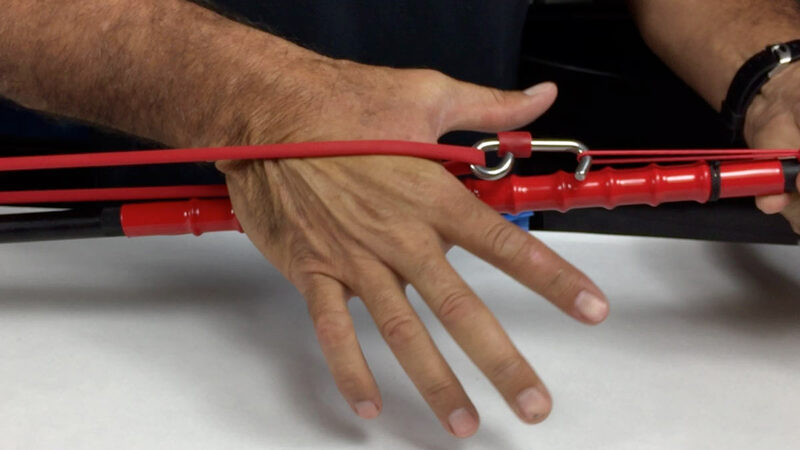 The "Gorilla Grip" quadruples the length of time you can hold your powered spear. Price: $11.95 installed. Each of the 3 prongs measure 11" long and are clustered in a brass fitting to ensure a tight grip. It connects to the MAKO Big Game Pole Spear using the included 3" adapter shaft. Connects Pole Spear Tips with 6mm female threads to Pole Spears with the industry standard 5/16" female thread. Use to connect the double flopper tips to the Big Game Pole Spear. Connects Pole Spear Tips with 6mm female threads to Pole Spears with the industry standard 5/16" female thread. Recommended for connecting 5 prong paralyzer tip to the Big Game Pole Spear. Best experience shopping I've had yet. Product, customer service, and shipping all best of the best. Only suggestion I'd give, is to expand wet suit line, with more products. more colors in same build quality. This is a very well made spear! i have used the " 3n1" traveler pole spear and the big game spear. there is quite a bit more mass behind the big game for accurate shots and more terminal energy. the build of the big game is better as well as the poles feel solid and does not need the adapter for the different spear heads. overall i would recommend this one over the traveler for repeat use. This was my first pole spear and it did not disappoint. Works perfect underwater tracks amazingly well, and super accurate. This is a solid pole spear! You'll definitely get your money's worth with this guy. It's great for large or small game and you can use all three sections, or just two for smaller gamefish. I highly recommend if you're looking for a step up from a JBL or Trident spear but don't want to wreck your bank account.